Very rare Yugoslavian issue in art-sleeve. ATOMIC ROOSTER, Devil's answer/The rock (D/71 Philips blue) BOTH SIDES NON-LP! BACK PORCH MAJORITY, Slippery Sal/Once again (USA/66 Epic) White label promo. Side 1 is a novelty song and one of the worst of its kind, but side 2 is fine jangly folk, totally unexpected after the first side! BOTH SIDES NON-LP!!! RARE, but less than above record! tiny woc. BEACH BOYS, Then I kissed her/Mountain of love (NL/67 Capitol black) small wobc. BEACH BOYS, Cottonfields/The nearest faraway (S/70 Capitol black) rare Swedish pic. BEATLES, She loves you/I'll get you (UK/63 Parlophone black) in "type 1" sleeve. Extremely nice copy for one from Brazil. Rare 1st pressing too. BEATLES, Hello goodbye/I'm the walrus (D/67 Odeon green) airplane cover, woc. Opening frayed and a small seam tape, otherwise OK.
BLUE CHEER, Summertime blues/Out of focus (USA/68 Philips turquoise) Stunning copy! BOJOURA, Once upon a time/For all we know (NL/71 CBS orange) plays better. RONNIE BOND, Anything for you (AUS/69 Page One red) RARE! No actual damage, but played quite a few times. Dedicated on back cover by Bonilla with pen. BOX TOPS, I met her in church/People gonna talk (USA/66 Mala) rare label issue! DAVID BOWIE, The laughing gnome/The gospel according (UK/67 Deram) plays better. ARTHUR BROWN, Gypsies/Dance (D/74 Gull) WHITE LABEL PROMO. White label promo in superb condition, tiny wol. KATE BUSH, Wuthering heights/Kite (D/78 EMI) same front as UK, different bc. BYRDS, Mr.Tambourine man/I knew I'd want you (D/65 CBS orange) cross on label. BYRDS, Mr.Tambourine man/I knew I'd want you (NL/65 CBS orange) great copy! BYRDS, Mr.Tambourine man/I knew I'd want you (NL/65 CBS orange) wol. BYRDS, All I really want to do/I'll feel a whole lot better (NL/65 CBS orange) great PS, wobc, quite rare. Disc perfectly playable, of course (wouldn't be here otherwise), but a bit crackly. Backcover stained, otherwise a fine copy. B-side non-LP, of course. CAN, Spoon/Shikako maru ten (D/71 United Artists) Small stoc, disc perfect! CHICKEN SHACK, Maudie/Andalucian blues (NL/70 Blue Horizon blue) great PS. CHICKEN SHACK, The loser/Telling your fortune (D/71 Deram) "R" stamp oc. NEIL CHRISTIAN, Two at a time/Wanna lover (D/66 Strike) looks worse. COUNTRY JOE/FISH, Fish cheer/Maria (D/69 Vanguard gold) B-SIDE NON-LP! CREAM, Crossroads/Passing the time (D/69 Polydor) wol. CREATION, Tom tom/Nightmares (D/67 Hit-Ton),looks worse. DAVID COPPERFIELD STYLE, Won't have you back/Didn't try to call (NL/68 Relax) RARE! SPENCER DAVIS GRP., Gimme some lovin/Blues in F (NL/66 Fontana blue/silver) wobc. SPENCER DAVIS GRP., Mr.2nd class/The sanity inspector (NL/67 United Artists) cc. BOTH SIDES NON-LP and rare too. Staples rusted away, some crackles too. Great 24 pages booklet!! DONOVAN, The hurdy gurdy man/Teen angel (D/68 Epic yellow) small woc. DOORS, Hello I love you/Love street (D/68 Metronome black)small name on bc/ stol. JOHN DUMMER, Nine by nine/Move me, don't leave me (NL/70 Fontana blue) stol. JOHN DUMMER, Nine by nine/Move me, don't leave me (F/70 Fontana blue) different Ps to above. BOB DYLAN, All I really want to do + 3 (F/64 CBS orange) first French issue, RARE! Great laminated sleeve with lovely pic. Slight rw. BOB DYLAN, Stuck inside of Mobile/Rita May (I/76 CBS) differetn cover! EARTH & FIRE, Wild & exciting/Vivid shady land (B/70 Polydor) Very rare Belgian PS. EARTH & FIRE, Ruby is the one/Mechanical lover (NL/70 Polydor) B-side non-LP. 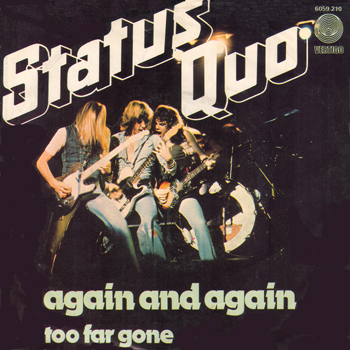 One of the last swirl singles, stoc. Brilliant PS with the Swiss police trying to stop a libidinous woman to assault Vanda. EPITAPH, Autumn '71/Are you ready (D/71 Zebra) both tracks non-LP! EROC, Wolkenreise/Fito Linte (NL/79 CNR) this is rare! Great classic hit single, miles above the pursuers. JOY FLEMING, Halbblut/Regentag (D/73 Intercord) rare Joy Unlimited singer solo. FUTURE, Thank you father/Love is all you've got (USA/69 Shamley) promo. A-side a hilarious fake-country ballad, worthy of BONZO DOG BAND, B-side melancholic harmony pop in minor keys. Strange unreliable bunch. GDANSK/MEKONS, 7" flexi issued by the great late Dutch "Vinyl" magazine for modern music IN ITS ORIGINAL GATEFOLD COVER. This is the disc no.18 from 1982. 1 track each by these bands. 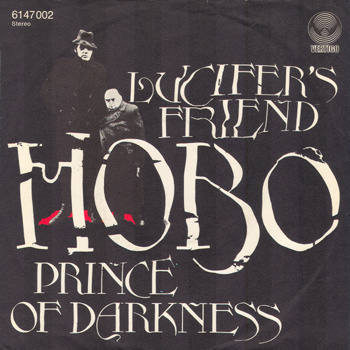 Rare advertising single, completely in style, in art-sleeve. Backcover a bit damaged. GREYHOUND, Black and white/Sand in your shoes (NL/71 Trojan) RARE!! JIMI HENDRIX, Hey Joe/Stone free (N/67 Polydor) as above but seams taped. One-sided issue by a German magazine. Hilarious intro spoken by Monika Dannemann, superb cover! JIMI HENDRIX, The wind cries Mary/Highway chile (N/67 Polydor) brilliant Norwegian PS! JIMI HENDRIX, The wind cries Mary/Highway chile (D/67 Polydor) Fine PS too! JIMI HENDRIX, Crosstown traffic/Gypsy eyes (D/68 Polydor) toc. 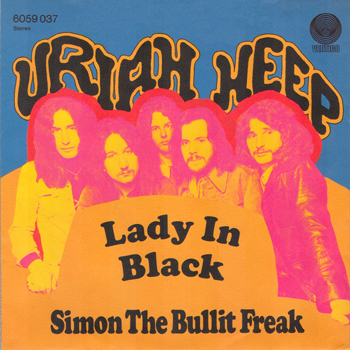 HERD, From the underworld/Sweet William (D/67 Hansa) A classic! HOLLIES, Listen to me/Do the best you can (NL/68 Parlophone black) small woc, stol. Extremely rare UK Kaleidoscope single with different PS to the UK! Credited to "Luv Wight". ILLÉS, Miért hagytuk/Marcius 1948 (H/70's Qualiton) GREAT PSYCH!! IN CROWD, Questions and answers/Happiness in my heart (USA/66 Viva) RARE!! IVY LEAGUE, My world fell down/When you're young RARE! Yes, 1955! 50 years old, older than some of you and still recommendable. In amazing condition. Are you? JETHRO TULL, Locomotive breath/Look into the sun (D/69 Chrysalis green) nice PS. 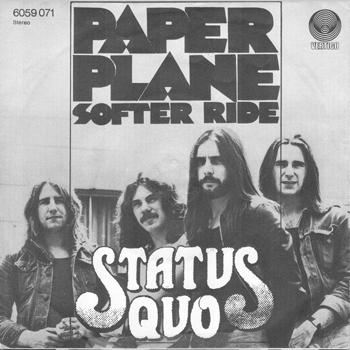 JOY UNLIMITED, Silvergun/Peace train (D/71 BASF) BOTH SIDES NON-LP! JOY UNLIMITED, Go easy go bahn/Komm mit uns (D/73 BASF) BOTH SIDES NON-LP! JUICY LUCY, Who do you love/Walking down the highway (NL/70 Vertigo swirl) tiniest of woc. JUMPING JEWELS, Java/Irish washerwoman (NL/64 Philips red/silver) looks a bit worse. KAYAK, Mammoth/Ballet of the cripple (NL/73 EMI) great art-sleeve. KINKS, Dedicated follower/Sittin' on my sofa (NL/66 Pye plum) tobc, looks worse. KINKS, Dedicated follower/Sittin' on my sofa (D/66 Pye plum) stoc, looks worse. KINKS, Mr.Pleasant/This is where I belong (D/67 Pye plum) NOT ISSUED IN THE UK. KINKS, Plastic man/King Kong (D/69 Pye plum) fine PS! KINKS, Father Christmas/Prince of the punks (NL/77 Arista) large ptt. LIQUID SMOKE, I who have nothing/Warm touch (D/70 Avco Embassy) Rare!! MACHINE, Lonesome tree/Mohammed Street (NL/70 Polydor) B-side non-LP and great! stoc. The backsleeve displays an absolutely hilarious dancing lesson: Britt & Bo Bendixen present "The Duck" in nine small photographs! Easy to learn, do it now! MANFRED MANN, Ha! ha! said the clown + 3 EP (F/67 Fontana black/white) great sleeve!! Rare German issue of this strange Australian crew. MONKEES, Daydream believer/Goin' down (D/67 RCA Victor black) miraculous B-side!! MONKEES, Alternate title/Forget that girl (D/67 RCA Victor black) best 7'', great PS! MOVE, Night of fear/Disturbance (UK/66 Deram) wol/c. MOVE, Fire brigade/Walk upon the water (D/68 Polydor) great PS!! MOVE, Chinatown/Down on the bay (D/71 Harvest) rare! GERRY MULLIGAN, Vol.6 EP (F/57 Vogue) GREAT COPY and sublime music. NASMAK/GULF PRESSURE, 7" flexi issued by the great late Dutch "Vinyl" magazine for modern music. This is the disc no.5 from 1981. 2 tracks Nasmak and 3 for Gulf pressure. UNIQUE!! Great PS, 1 taped seam, disc plays better. OUTLAWS, Tell them again/Empty dust bin (USA/70 Philips yellow) RARE! Nice copy, graded conservative. Small woc and stol. Comes with a lyrics clip. Rare "A" DEMO. Hopelessly supercilious covers, though. PETARDS, Hand of fortune/Free (D/70 United Artists beige) BOTH SIDES NON-LP!! PETARDS, Hand of fortune/Free (D/70 United Artists beige) woc. Great 4 track EP from the original soundtrack. with a nice PS. POWERS OF BLUE, Satisfaction/Good lovin' (USA/66 MTA) White promo. Fuzz all over!! PROCOL HARUM, Homburg/Good Captain Clack (NL/67 Stateside) nice psych pic. PROUD ONES, Sing along/Leavin' in the morning (NL/71 Onyx) RARE!!! Q'65, From above/I was young (NL/66 Decca blue ffrr) plays clearly better! As far as I know there are no stock copies of this. A rare but average rock ballad. Ever so rare EXPORT EP in really fine condition, almost EX. UK EXPORT DISC IN DK SLEEVE, RARE!! ROLLING STONES, The last time/Play with fire (D/65 Decca winered/gold) plays better! UK EXPORT DISC IN DK SLEEVE!! ROLLING STONES, Satisfaction/Under assistant west coast promo man (NL/65 Decca blue ffrr) stobc. UK EXPORT DISC IN NL SLEEVE!! UK EXPORT DISC IN DK SLEEVE! Quite some variations on this picture sleeve. This copy has "I'm free" on the right and the top bar is brown. The title track is in a big font. Definitely one of the rarest 60's releases by the Stones: a one sided 5" flexi in an envelope, issued by a Yugoslavian magazine. The sound quality is certainly acceptable for a release like this. Opening frayed, disc looks well-played. ROLLING STONES, Paint it, black/Long long while (NL/66 Decca blue ffrr) seams taped. ROLLING STONES, Paint it, black/Long long while (F/66 Decca blue boxed) great PS! ''Decca in shirt'' PS variation. SANDY COAST, Capital punishment/My friend Abdullah (NL/69 Relax) Great!! SEARCHERS, Goodbye my love/Till I met you (D/65 Vogue) tiny woc. Of course a different PS. SHOCKING BLUE, Shocking you/Waterloo (D/71 Metronome black) B-SIDE NON-LP. SHOCKING BLUE, Ink pot/Give my love to the sunrise (D/72 Polydor) small woc, B-SIDE NON-LP. SMALL FACES, Hey girl/Almost grown (UK/66 Decca blue ffrr) cheapo! plays reasonably. UK EXPORT DISC IN DK SLEEVE. SMALL FACES, Here come the nice/Talk to you (D/67 Columbia turquoise) fine PS! SMALL FACES, Itchycoo Park/I'm only dreaming (D/67 Columbia turquoise) fine PS! SMALL FACES, Lazy sunday/Rollin' over (D/68 Immediate white) fine PS! SMALL FACES, Lazy sunday/Rollin' over (NL/68 Immediate grey) superb PS! Seriously rare nowadays, bc has some tape residue. SPOOKY TOOTH, Waiting for the wind/Feelin' bad (D/69 Island pink) small w/toc RARE! STATUS QUO, Pictures of matchstick men/Gentleman Joe's sidewalk cafe (D/68 Pye plum) Small toc, general seam wear. STRAWBS, Lay down/Backside (D/72 A&M mustard) B-side non-LP. STRAWBS, Shine on silver sun/Wherefore (D/73 A&M mustard) B-side non-LP. SUPERSISTER, Radio/Dead dog (NL/73 Polydor) B-side non-LP. SUPREMES, Where did our love go/He means the world to me (NL/64 Motown) stobc. TEE-SET, Now's the time/Bring a little sunshine (NL/68 Tee-Set Records) fine PS! TOAD, Stay!/Animals' world (D/71 Bellaphon) both tracks non-LP! TRAFFIC, Hole in my shoe/Smiling phases (D/67 Fontana black/silver) plays better. rare and in a superb laminated PS. wol/bc. TROGGS, Hip hip hooray/Say darlin'! (D/68 Hansa) both from Mixed Bag! TROGGS, You can cry if you want/There's something (USA/68 Fontana)from Mixed Bag! VERY strange cover of this ultimate cover song! 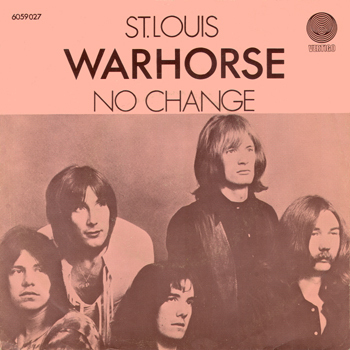 WARHORSE, St.Louis/No chance (NL/70 Vertigo swirl) small woc. Undocumented and rare single by Tomorrow hero. Wrong German spelling authentic! WHO, My generation/Shout and shimmy (UK/65 Brunswick) stol. WHO, Substitute/Waltz for a pig (D/66 Polydor International) nice PS! WHO, Happy Jack/I've been away (D/66 Polydor) Great PS drawn by Steadman. WHO, Happy Jack/I've been away (NL/66 Polydor) looks worse too. One-sided RED vinyl flexi, given away with a magazine, non-LP track and a brilliant one too! Promo CD single with nice PS. YARDBIRDS, Shapes of things/Paff.....bum (D/66 Epic yellow) also an excellent copy , miracles! YARDBIRDS, Shapes of things/Paff.....bum (D/66 Epic yellow) wol. YARDBIRDS, Shapes of things/Paff.....bum (D/66 Epic yellow) initial on c, plays better! Sleeve in great condition!, disc plays better than it looks. This is, needless to say probably, RARE! ZOMBIES, She's not there/You make me feel good (UK/64 Decca blue ffrr) plays better. Ordering, more information, comments, offers please by: e-mail, thank you very much.